Suggested Emphasis or Theme: Deception is wrong and leads to hurt and anger. Esau and Jacob were the twin sons of Isaac and Rebekah. Esau should have inherited the responsibilities and blessings that come with being the oldest son but he rashly sold his birthright to his younger brother for a pot of stew. Later, in an elaborate act of deception, Rebekah helped her favourite son, Jacob, trick the elderly and blind Isaac into promising him the rest of the birthright. Jacob escaped his angry brother by traveling to his mother’s people (in the city of Haran) to find a wife. After the hopeful beginning of Isaac and Rebekah’s marriage it is painful to see the dysfunction that has eventuated in their family. After twenty years of infertility Rebekah became pregnant with twins. Even while pregnant with twin boys Rebekah could feel them fighting within her womb. Rebekah asked God about this. (Genesis 25:19-34) As the oldest, it would have been expected that Esau would receive the “birthright“. This was recognition of the chief position in the family and the inheritance of a double-portion of everything a father owned. The incident where Esau rashly “sells” the birthright to Jacob for some stew reveals that Esau did not appreciate the gravity of this blessing and that Jacob had had his eye on it. (Genesis 27:1-40) The family blessing was more personal than the birthright. The passing on of this blessing would give purpose, honour and direction for the future of the family. Years before God had promised to bless Abraham and subsequently the world through his descendants (Genesis 12:1-3). Isaac, himself, had received a blessing from God (Genesis 23-24). Isaac was old and blind when he decided it was time to pass on the family blessing on to Esau. The favouritism that he and Rebekah had shown their sons (Genesis 26:27-28) had created an environment where lying and deceit had become acceptable. The personal traits of each family member became evident as the event unfolded. Isaac: Earlier in life it was apparent that he, himself, was not above deception. He lied to the Philistine king, Abimelech, to protect himself (Genesis 26:6-10). He has displayed favouritism in his relationship to his sons. He and Esau have particularly bonded over hunting and the outdoors and Isaac wants to make this part of the occasion. Rebekah: Like her husband, she favours one son over the other. She is controlling and willing to scheme against both her husband and older son so that Jacob will have the blessing instead of Esau. Esau: His earlier flippancy about his birthright and his bad choices in women (Genesis 26:34-35) depict a rather shallow man without a true sense of self. Jacob: Always willing to scheme for what he wanted Jacob also seems weak and lacking in moral character. When his mother devised the plan to deceive Isaac, Jacob’s first concern was for how the plan could work rather that whether or not it was the right thing to do. (Genesis 27:41-28:5) Ever the schemer, Rebekah protects her favourite son from the wrath of his older brother. She maneuvers the situation so that Isaac sends Jacob back to Haran and Rebekah’s family. Jacob received the blessing from Isaac. The entire event shows how God works his plans through all kinds of people. He allowed this family to follow their selfish desires because he had always intended that Jacob would receive the blessing. God knew the potential of Esau and the potential of Jacob and knew which one would be most fitted to the hard task of leading the next generations into the future. Jacob will go on to learn many hard lessons in life but God will work with him and on him to make him the man he should be. God promised Abraham and later his son, Isaac, that a great nation would come from them. They would have many descendants. Isaac and Rebekah were married for twenty years before they had children. Finally, Rebekah became pregnant. And guess what. She was going to have twins! But there was a problem. Rebekah could feel the twins fighting inside of her. She did not like that at all so she asked God about it. When the twins were born they were very different from one another. The first boy was red and very hairy when he was first-born and they named him Esau. Isaac liked Esau the best. The second boy was born right after the first one (in fact he was holding his brother’s heel when he was born!) and his parents named him Jacob. Jacob’s skin was very soft and smooth. Rebekah liked Jacob the best. Parents should love each of the children and not have favourites. But Isaac and Rebekah were not good parents in this way. As he grew Esau loved to be outside and was a very good hunter. His father, Isaac, loved to eat the tasty meat from the animals Esau caught. Esau was his father’s favourite son. Jacob was quieter and enjoyed working around home. His mother, Rebekah, loved him best. One day Jacob was home cooking some stew. Esau had been out hunting and when he returned, he was very hungry. “Not unless you sell me your birthright,” said Jacob. 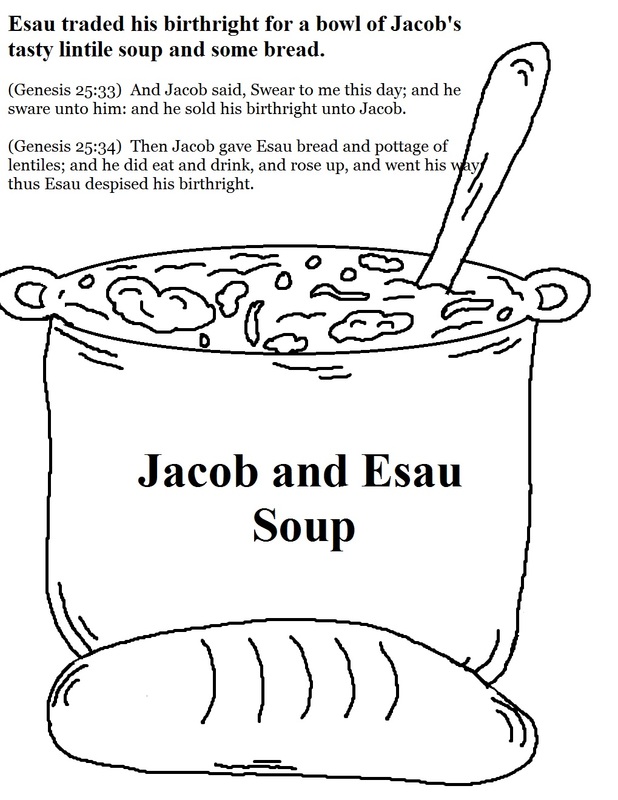 So, after Esau promised to sell his birthright to Jacob, Jacob brought him bean stew, bread, and something to drink. Esau thought he had made a good trade but really Jacob was the one who got the better deal. Jacob had played a mean trick on his brother. Because he was the oldest, Esau would have received special treatment when his father died. To have the birthright was a very special privilege and duty. He would be in charge of many things. But Esau did not take this seriously. He gave all of that away for some stew. Esau had given up his birthright to his younger brother but there was something else that was very special in a family. The father of the family would give a special blessing to his son. In the blessing the father would say who would get the most respect and who would be the leader of the family. He would give good wishes of wealth, power, and safety for his son’s future. When Isaac was very old he called Esau, his oldest and favourite son, to him and said, “I am going to give you the special family blessing today. Go and hunt for some wild game to cook the tasty food that you and I like to eat so much. We will eat together and then I will bless you.” So Esau set off to go hunting. But someone else overheard what Isaac was saying. Remember how we said Esau was Isaac’s favourite son and Jacob was Rebekah’s favourite son? Well, Rebekah did not want Esau to have the blessing. She wanted her favourite son, Jacob, to get the blessing instead of Esau. Rebekah decided to trick (or deceive) her husband. She called Jacob to her so they could make a plan together. Jacob should have stopped his mother but he went right along with the plan. Rebekah told Jacob that he they would trick Isaac. They needed to fool him into thinking that Jacob was Esau so that he would give him the blessing instead. Here’s how the plan would work. First, she told Jacob to go and kill two goats so that she could prepare them just the way that Isaac liked. Isaac would eat the goats and think they were the wild game that Esau had hunted. Next, they had to make Jacob’s smooth skin feel like his harry brother’s skin. Rebekah put goatskins on Jacob’s arms and neck so that Isaac would feel them and think it was hairy Esau. She also put Esau’s clothes on Jacob. All of this should fool Isaac because Isaac was old and blind. So, when Jacob went into his father’s tent his father could not see that it was Jacob. He wasn’t sure so he asked to feel Jacob’s hands. When he felt the goat skin he thought it was Esau’s hairy hands. When he tasted the goat meat he thought it was wild game that Esau had hunted. When he smelled Esau’s clothes on Jacob he really thought it was his oldest son. Isaac had been tricked! So Isaac gave the blessing to Jacob. This was so important that, once the blessing had been spoken, it could not be taken back. Isaac had just finished giving his blessing to Jacob when Esau came in from hunting. He fixed some tasty food just like his father had asked and took it to his father so that he could receive the blessing. “Who are you?” asked his father. Then he realized he had been deceived. “Someone else has already hunted an animal and brought it to me. I blessed him and the blessing cannot be changed.” Isaac was very sad and angry. His own son had deceived him. “Esau became very angry and begged his father to bless him too. “Jacob tricked me two times,” Esau cried. First he took my birthright and now he has taken my blessing.” Esau was so angry that he decided to kill Jacob once his father died. When Rebekah heard about Esau’s plans, she sent Jacob to stay with her brother Laban until Esau calmed down. She told Isaac that Jacob could find a wife there. Everyone in the family was hurt because Rebekah and Esau decided to lie and trick Isaac. Tricking someone is called deceit. This is what the Bible says about deceit. 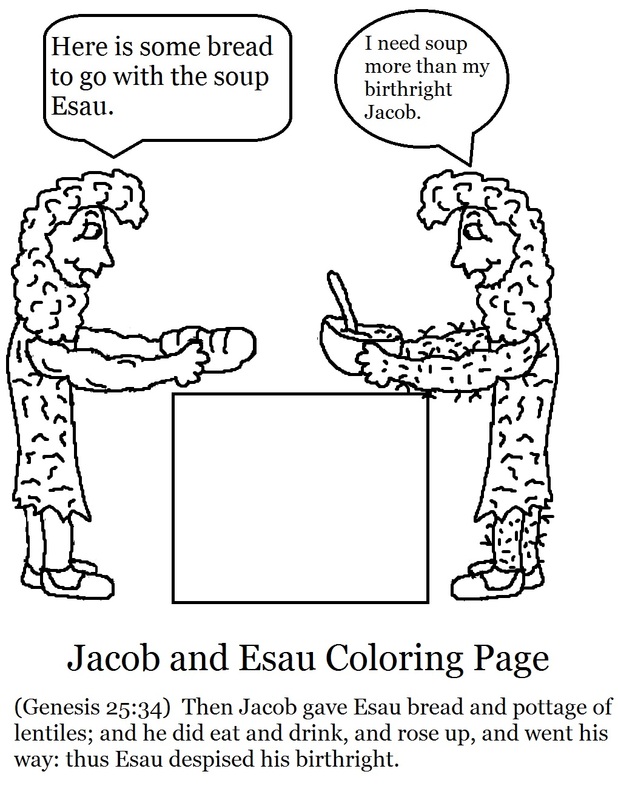 How were Esau and Jacob different? Esau was hairy and liked the outdoors (his father’s favourite). Jacob liked the indoors and was his mother’s favourite. What was the thing that Esau traded his birthright for? A bowl of stew. How did Rebekah and Jacob trick Isaac into giving the blessing to Jacob? Cooked goat meat to taste like wild game, tied goatskin to Jacob’s arms and neck to feel like Esau’s hairy skin, and put Esau’s clothes on Jacob. Isaac was blind and he was fooled into giving Esau’s blessing to Jacob. What did Esau want to do to Jacob? He wanted to kill him. Talk about twins. Some sets of twins are identical which means they look exactly alike. Some sets of twins are fraternal which means they are simply siblings and may or may not look alike. Fraternal twins can even be two different sexes. Look up “deceit” in a dictionary and a thesaurus. Discuss what it means. Talk about examples that the children understand. Write the names of the main characters in today’s story on slips of paper (or show their pictures if the children are too young to read). Blindfold one child. Hold up the name of one of the characters so that the other children know which one it is. Let the children give hints to the blindfolded person so they can guess which character it is. Make some stew in class then share. Help the children learn today’s memory verse. Click here for ways to do this. Write attributes (hairy, youngest, hunter, mother’s favourite, etc.) of each of the brothers on small pieces of paper. Hand these papers out to the children. Draw two figures on the chalk/white board. Write “Esau” above one and “Jacob” above the other. Ask children to take turns coming up and writing the attributes on the correct figure (or tacking them on the board with blue-tac or tape). We teach our first grade class about the selling of the birthright for red lentil stew. As a visual aid, we bring in lentils for them to see up close and touch and make up small snack size bags for them to be able to take home with them. We have also thought about having some lentil soup for them to try in class. What a great idea. I’ve used the lentil soup idea too. The kids loved it. Thanks for sharing your good ideas.